The original version of Landcross was available both as a giftset and separately as Wingwaver, Dashtacker, and Machtackle, although the individual robots were never sold separately. 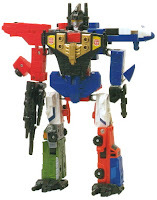 In addition to transforming separately into robot and vehicle modes and combining into Landcross, the six toys could also be combined in two-robot pairs, with one robot forming the head, upper torso, and arms and the other forming the lower torso and legs. The six robots' guns could be combined into a single large weapon. I bought my Landcross giftset from a seller based in Japan, who offered it to me at a pretty reasonable price. With the acquisition of Landcross, I am down to my last two combiners to complete my dream list of 14 combiners. Way to go my friend! Two more to go! This is one mint Landcross giftset!